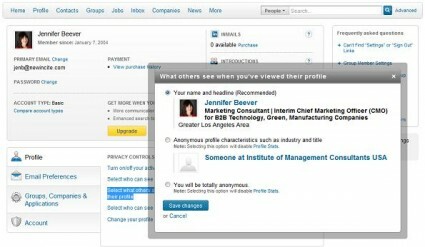 Recently a client asked a great question: “What information can individuals see when you view their profile on LinkedIn?” The answer is that unless you change LinkedIn’s default settings, individuals whose profiles you’ve viewed will see it all – photo, name, title, company and geographic area, and a hyperlink to open your profile. The video below (2 minutes and 55 seconds) shows you how to change your privacy settings on LinkedIn to mask your profile so that people cannot tell who is looking at their information. Note that the default for sharing open information follows LinkedIn’s purpose of connecting people online to share information, resources and get introductions to others. If you do limit the information provided to those whose profiles you view, the trade off is that LinkedIn removes your ability to see reports on who has viewed you! But some people may be conducting sensitive business or research online and not want to be discovered for doing so. Watch the video to find out how to protect your identity when viewing LinkedIn profiles. If you’d rather read about it, scroll down below the video to read the text instructions. Here are text instructions for those of you who don’t want to watch a video. Go to your Settings page in LinkedIn (select Settings from the drop down menu by your name in the upper right corner). Select the menu option settings. That’s it! You’ve updated your privacy settings for what displays to others on the LinkedInWho Has Viewed My Profile report! Comments? Feedback? Are there good reasons to hide your identity on LinkedIn? Previous post: Is Your Marketing Consultant Strategic? Tactical? Or Both? Next post: Does Your Pricing Leave Money on the Table?